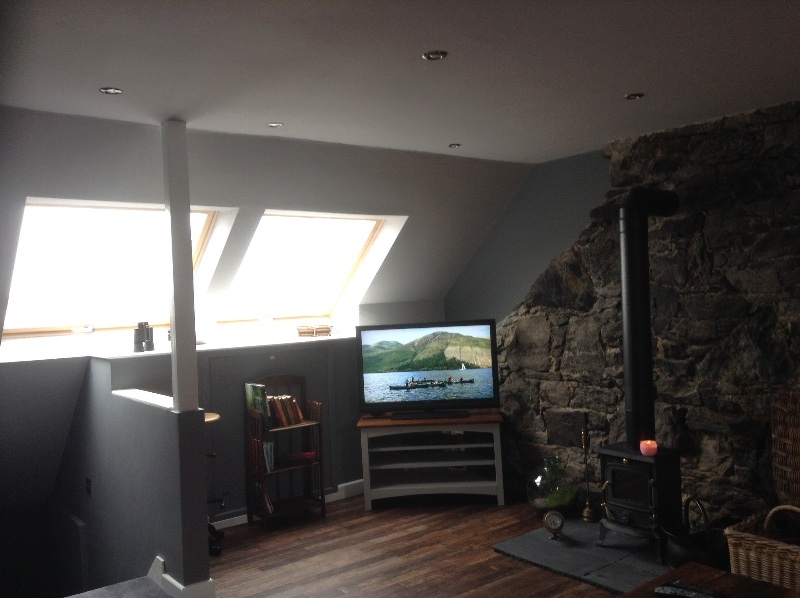 New for 2017, a cosy loft conversion for two adults in the heart of Castlebay, situated above the Post Office. 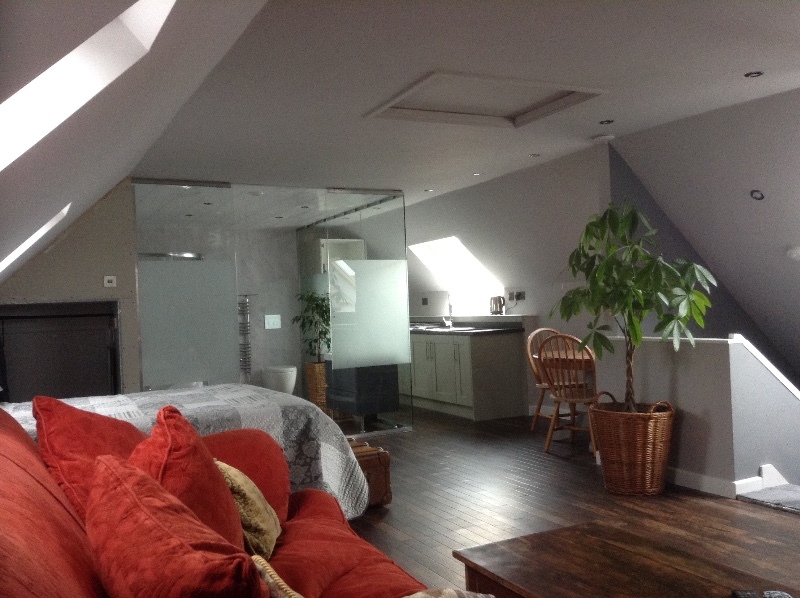 A luxury alternative to a hotel room, it is a large open plan loft with a stylish frosted glass walled bathroom. 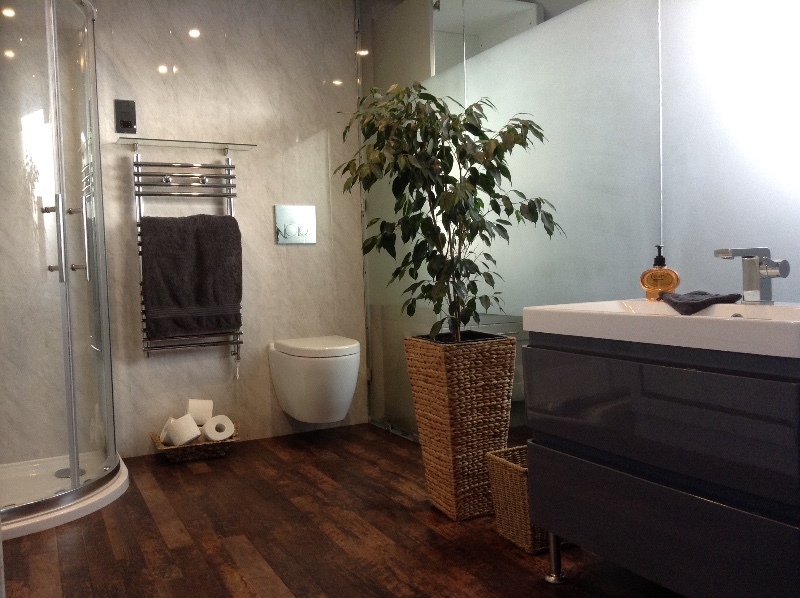 This has a bath and a large separate shower enclosure. A small but well equipped galley style kitchen has a dining table for two at the end, leading in to the area with the King size bed and then the living area. 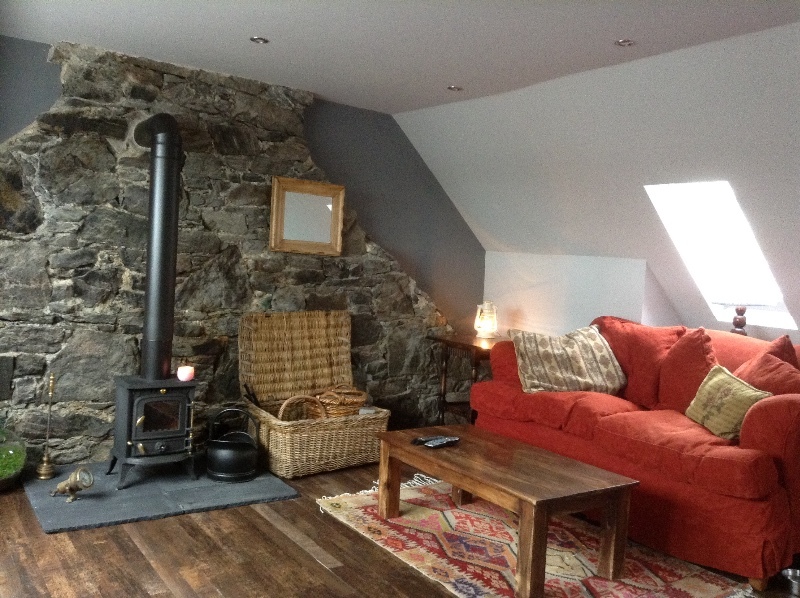 A comfy sofa sits next to the stove which comes with all the coal, logs and peat you need to be toasty warm whilst you watch the large tv with basic Sky package. 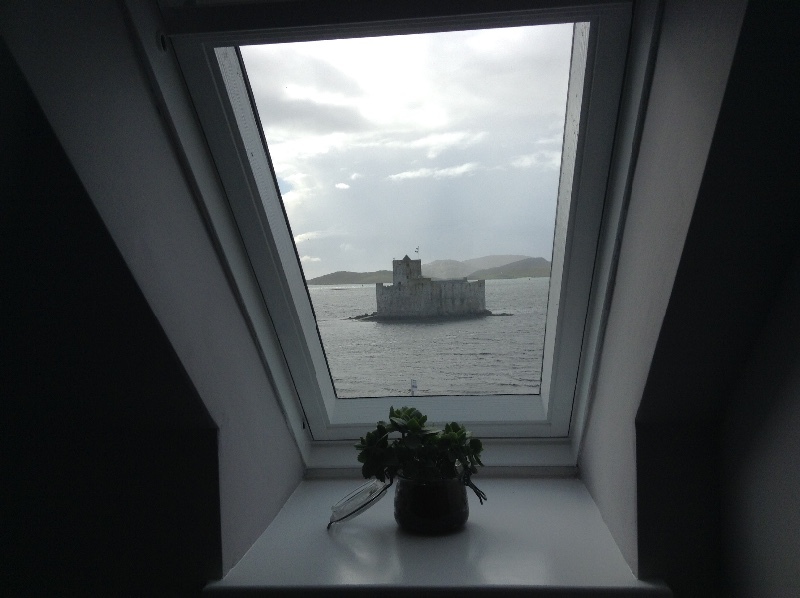 Large windows give beautiful views over Kisimul castle, Vatersay and beyond. There’s even a stool to perch on whilst you gaze out of the window. Free wifi is included, as are all towels and bedding. Please note that the loft is at the top of two flights of stairs and access is via the living accommodation above the Post Office. One or two small dogs may be allowed, but this MUST be discussed at the time of booking. An enclosed garden is available exclusively for the use of loft guests and this overlooks the castle. Parking is available on the street. 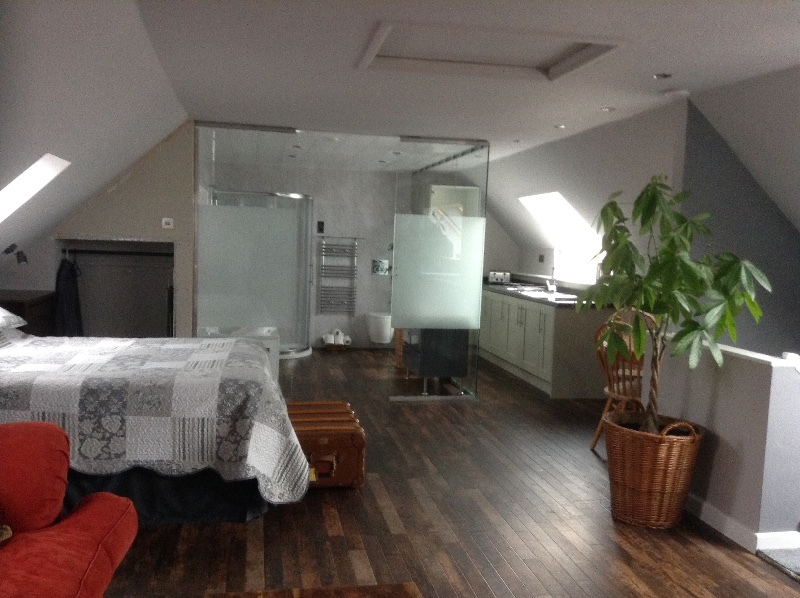 We stayed in this wonderful loft in August 2018. 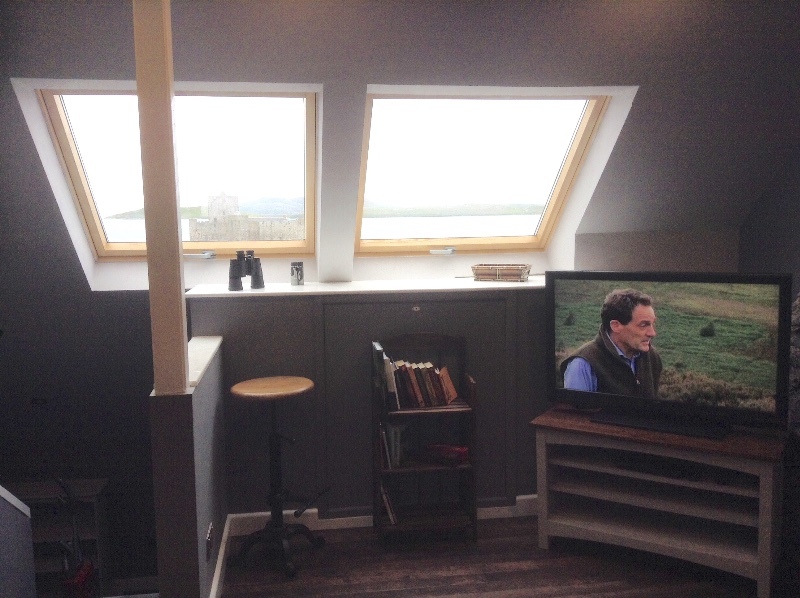 We had a great time in Barra and the loft is the perfect base to explore the island. It is beautifully decorated and very cozy, perfect for those rainy evenings (though we had a lot of sunshine on our holiday!). Chris, Diane and Spud made us feel very welcome. We really want to go back! 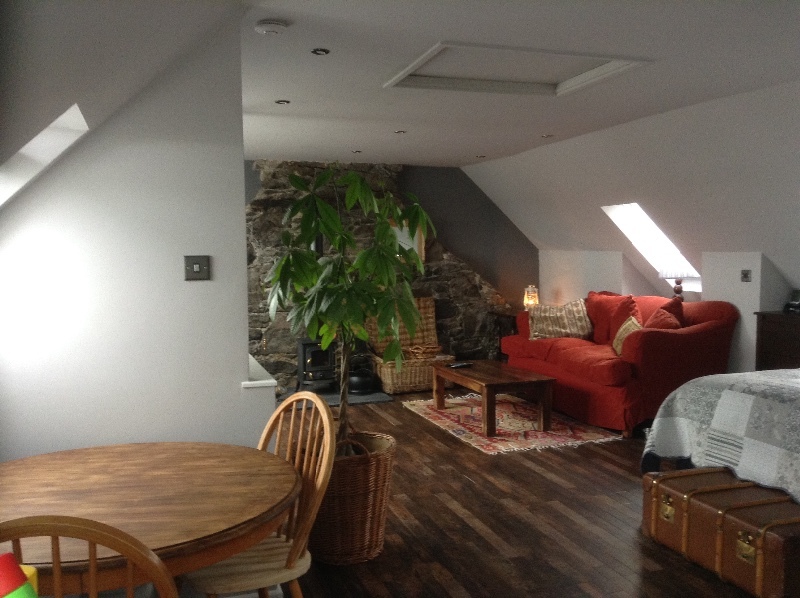 We had a lovely 3 nights on Barra, staying with Chris and Diane, who have converted the loft space above their post office and tearoom in Castlebay into a fabulous, cozy yet very stylish apartment, with small kitchen, large bathroom and living space from one large airy room. 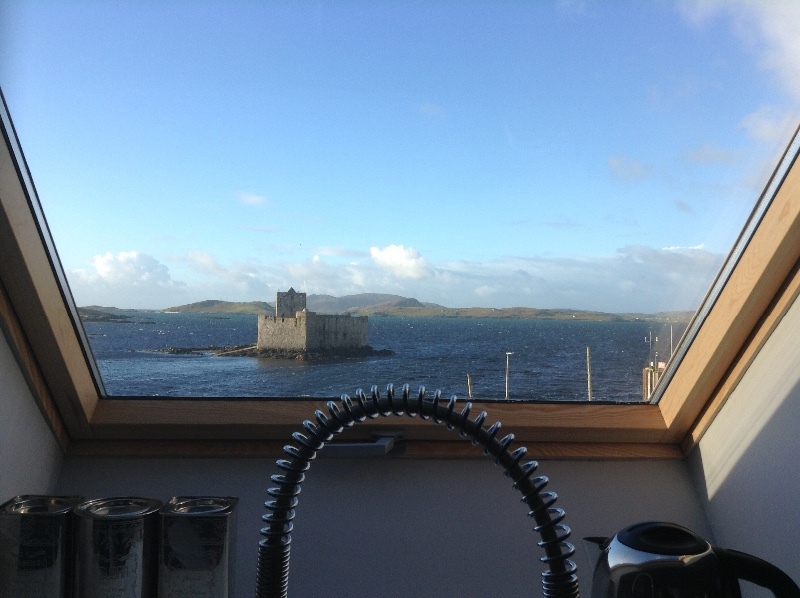 The windows look out onto Kisimul castle (very nice of them to have organised such a lovely view!) and we were there during the longest day, so could see everything so clearly right until midnight. As I’m a bat dweller, I did worry about the room being dark enough, despite the blackout blinds on the windows. Diane very kindly fitted some blackout material over the large bathroom window after the first night, and my cave was complete with a very comfortable bed. What a star! Chris was always very chatty when we met him coming and going during our stay and provided lots of info on the local restaurants and places to go, despite being busy in both the tearoom and post office. Lastly, the 3rd member of the dream team was Spud, a tiny bundle of joy and energy who ‘guards’ the post office and was always very happy to bestow kisses on anyone he could reach. 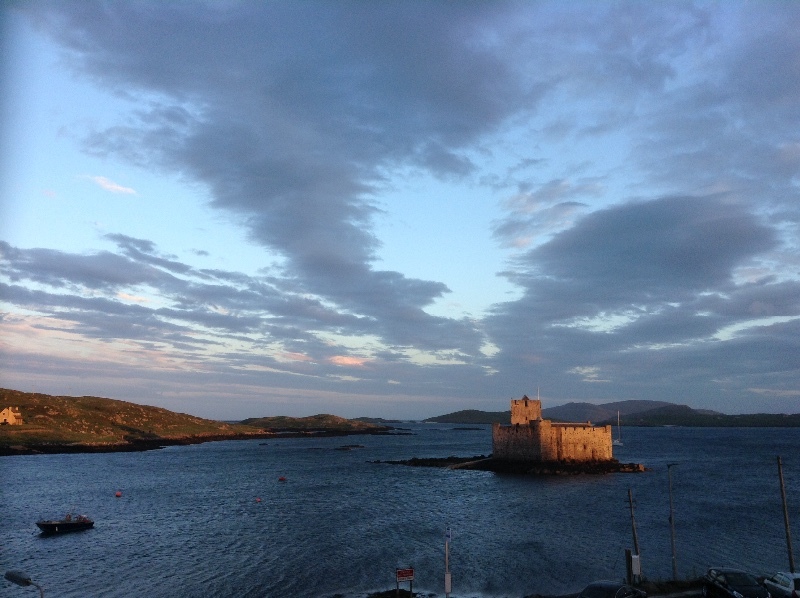 Can thoroughly recommend the Loft as a base to explore the magical island of Barra, to return to one of the famous scones at the Tearoom. We didn’t get the chance this time, but will make sure we do when we return again. 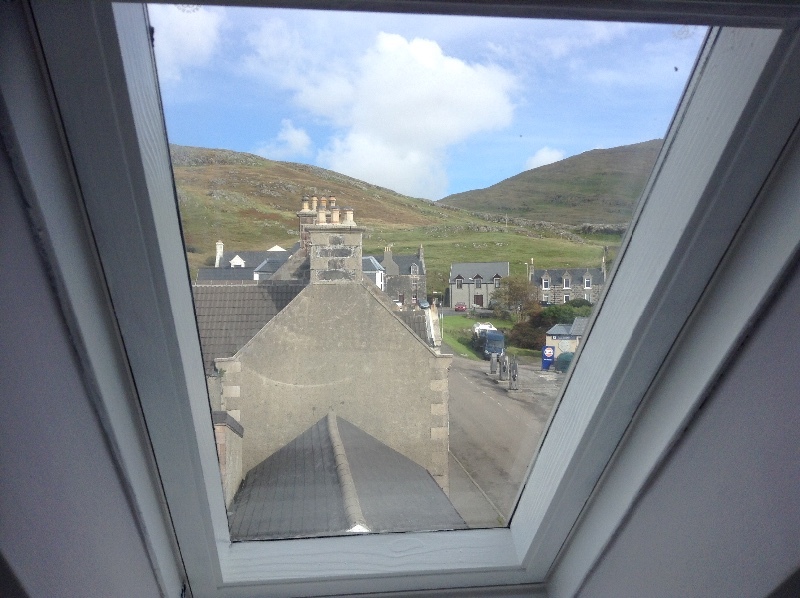 I have done my homework and looked at literally all Barra accommodation I could find. I don’t think there’s a better place to stay on the island than this. It’s new, it’s spacious, it has many modern amenities, it has a great view, it’s conveniently located – it has brought Barra accommodation into 2017 and that’s a good thing. First, the location. 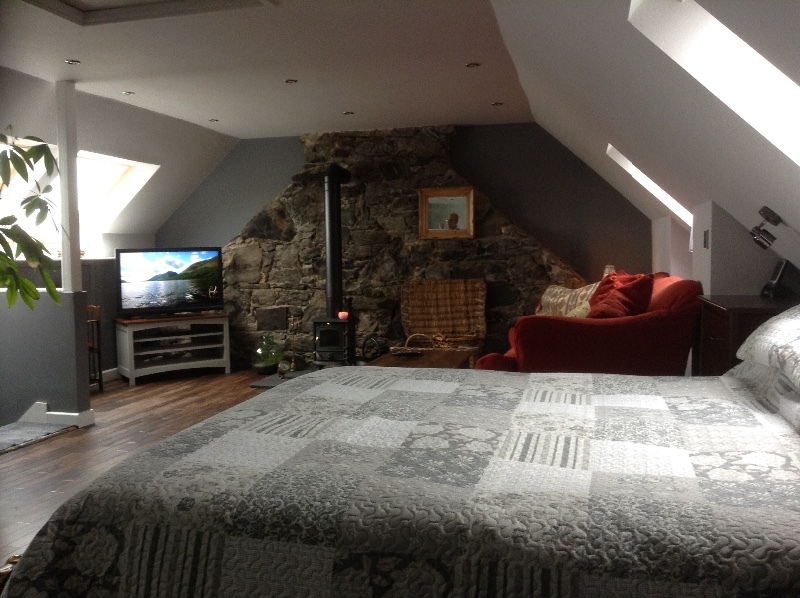 Very conveniently located close to the ferry pier and opposite Kisimul castle. The loft is above the post office and the tearoom, run by the same proprietors, which is very handy (and tasty). There is enough parking space right across the property and the gas station is on the same street. Also on the same street is a supermarket, with another supermarket two minutes away. If you’re flying in, the loft is about a 20 minute drive from the airport, literally door to door. The loft itself. It’s newly done and that shows. 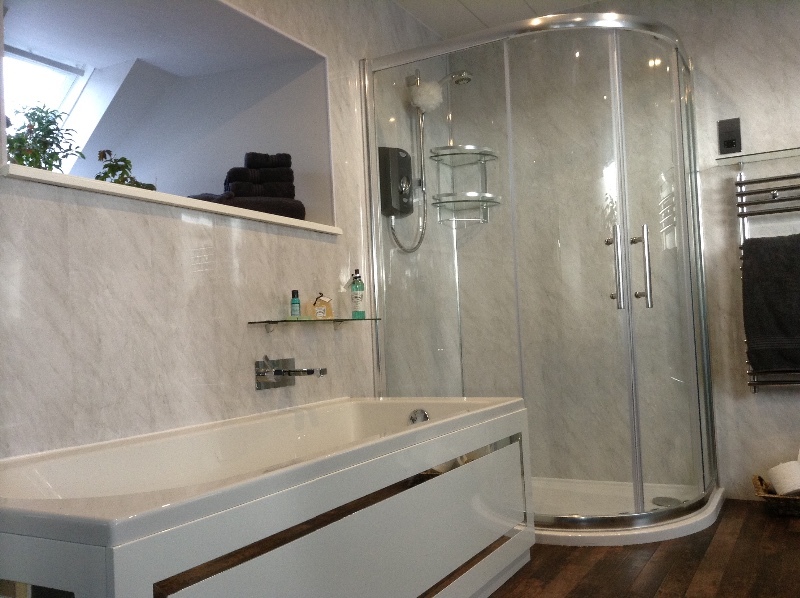 White walls, new windows, glass bathroom walls, bath, separate shower, modern kitchen. This is combined with authentic details like showing one original, stone outer wall. The colours of the furniture and floor give it a cosy feel, and there is of course the great fireplace that warms the place up much faster than you’d expect. This may sound strange, but I love the fact that there are plants (real and sizeable). Personally, I had to get used to the rather springy bed, in which you can feel each other’s every move – however, that might also be because we are used to sleeping on individual mattresses and under individual covers, and because my husband is 2 metres tall. There are lots of nice details, some handy (binoculars, enough places to charge your devices, including usb slots) and some that make you smile, coasters that say ‘Tea is the answer to everything’ (that are also for sale in the post office) and lots of books (about the area, but also of course Whiskey Galore! from which the name of the loft originates, and the funny Fifty Sheds of Grey – you know you share a sense of humour with your hosts if you come across a book like that). 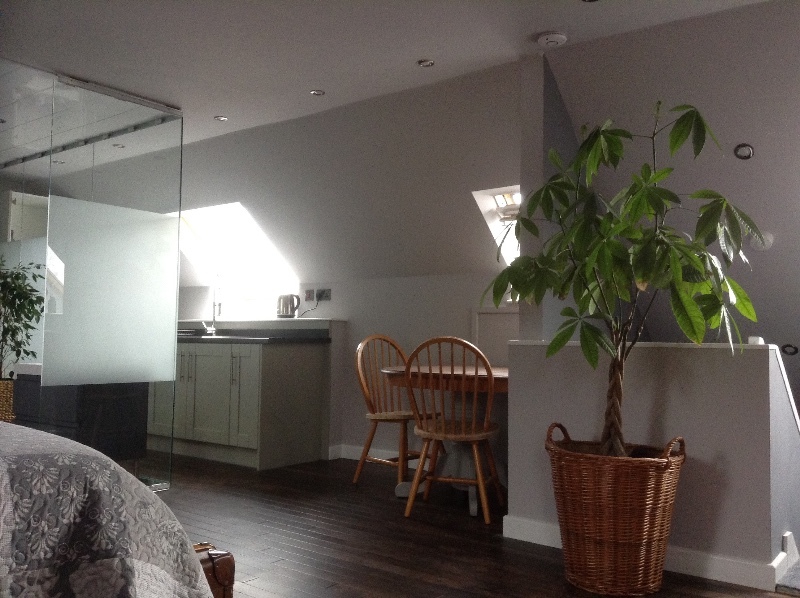 Tv, kettle, full equipped kitchen, everything you need. During business hours, the loft can be accessed through the post office (you do have your own key to the door that leads to the stairs so it can be locked if you want to), outside of business hours you can use the side door, so there are no time restrictions. Lastly, Diane and Chris. Very warm, lots of laughs, very sweet and attentive. If you want to chat, fine (and they have the answer to basically any question about the island you might have), if you don’t, they’ll leave you alone. They genuinely want you to have a good time and nothing is too much trouble to make that happen. 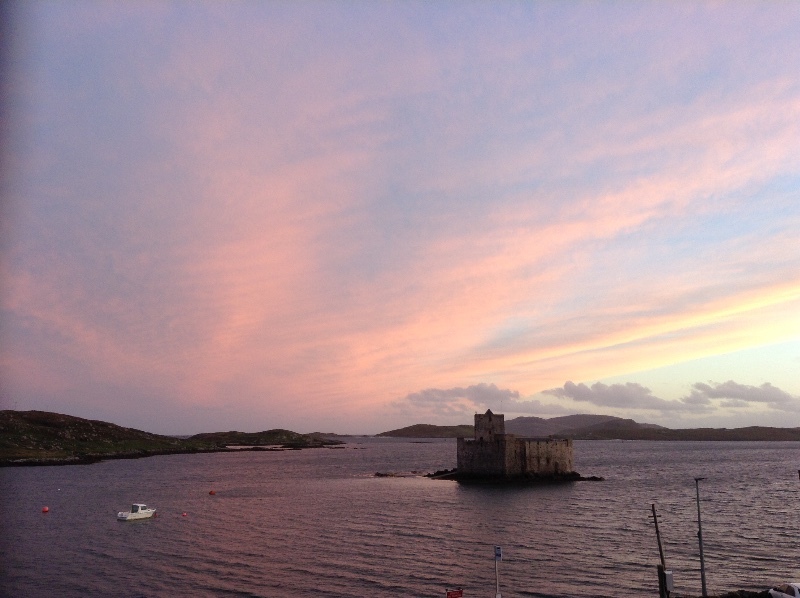 We had two separate stays (with three nights on Harris in between), and when we came back it felt like a warm blanket – their enthusiasm in seeing us again, and also in the literal sense because the fireplace was lit to warm the place up before we came. Lovely. We stayed three nights at Chris and Diane’s place which was great. It is very large, near new, very comfortable and very well appointed with a beautiful view to the castle. 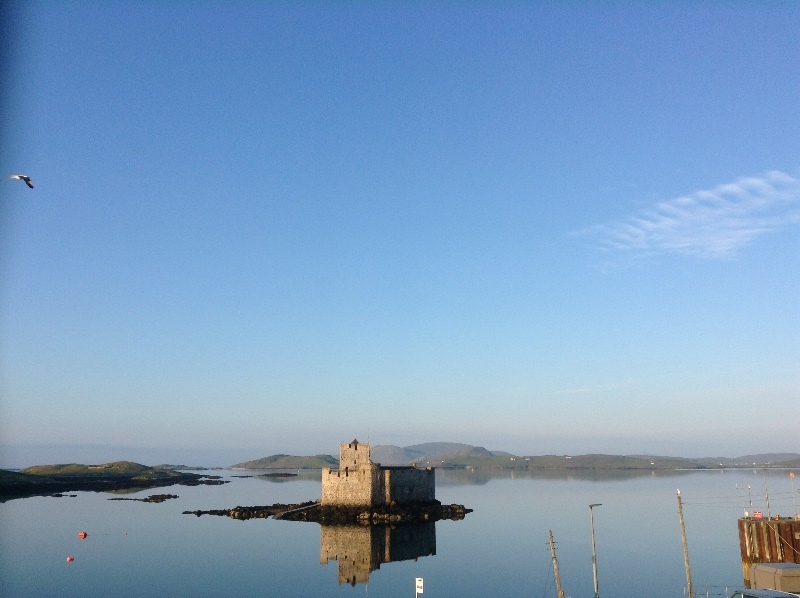 Chris and Diane are so helpful and friendly, it was a pleasure to meet them (and Spud the miniature dog).It is near the ferry terminal and above the coffee shop and post office.A great experience in Barra! We had a wonderful stay in the loft. It is beautifully converted. Chris and Di were lovely and had added lots of small touches that made our stay extra special. We had everything we needed and more. I definitely recommend and would stay there again. As the previous review says- the scones are amazing! We stayed here for 3 nights and had the most wonderful time. Chris and Di are perfect hosts and made us feel as if we were long lost relatives come to stay. Nothing was too much trouble. 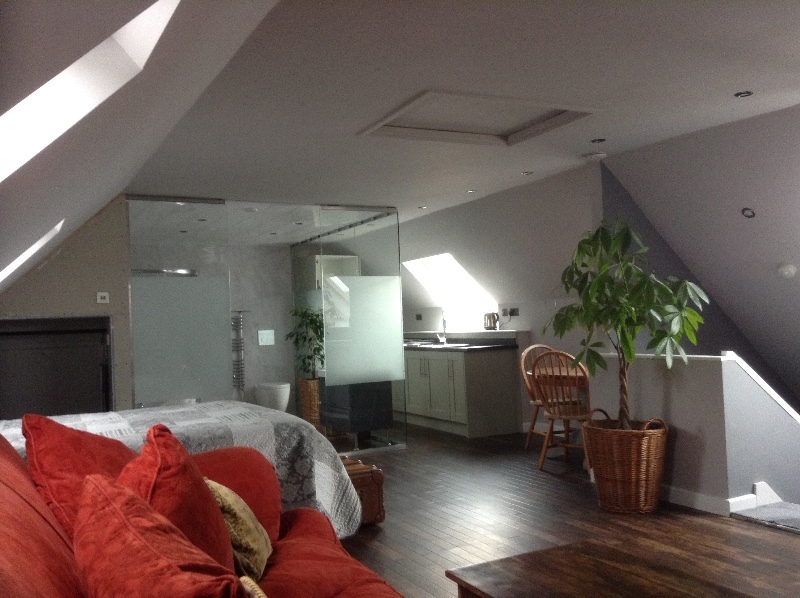 The loft is spectacular and has been done to the highest standard. The views out of the windows and the castle are amazing. The tea room downstairs makes the best coffee and scones I have ever tasted! Extras: Free WIFI, electricity and fuel included, also towels and bedding.